Okay I admit it, I have a bit of an obsession with Rhubarb. It is one of my favourite fruits and because it’s in season at the moment it’s very easy, and cheap to get a hold of. I will do some chutneys towards the end of the season but at the moment it’s so tender there is very little cooking to do with it. The only ingredient in this recipe that isn’t Irish is the fruit sugar that I used to poach the rhubarb, however if you can get your hands on a decent Irish apple juice then that would be perfect instead of sugar. Since January close friends and family of mine have been on a health kick. Not in a New Year resolution sort of way, more in a life-changing way. Himself has lost nearly 2.5stone at this stage and his pals and my two gorgeous friends, A & S, aren’t too far behind. Their diet can be restrictive when it comes to sweet treats. Since they started this journey towards a healthier self when I cook or bake something particularly bold I get admonished, just a little bit, but all the same it’s very unfair of me to taunt them when they are doing so well. The last time I did a rhubarb treat it was definitely on the forbidden list of foods that they couldn’t eat. I promised that the next “sweet” item would be more diet friendly and less time consuming. There are some very few steps in preparing this treat and it is suitable for eating anytime of the day but personally I think it would be a refreshing breakfast or mid-morning snack. I got the idea from the UK version of Masterchef where a finalist did a “rhubarb spaghetti”. My knife skills aren’t that good so hence the “tagliatelle” version. You could replace or add to the oats by using flaked almonds, sunflower seeds, raisins, sultanas or indeed any dried fruit or nuts. Heat your oven to 200 degrees Celscius. Chop the ends off the rhubarb sticks and rinse away any dirt that may be on them. Using a sharp knife cut the rhubarb into narrow strips, the full length of the stick of rhubarb. In a large saucepan place the fruit sugar and the water and bring to a very slow simmer. Pour your oats onto the large baking tray and spread them flat and thinly. Place the baking tray into the oven. Put the rhubarb strips into the pot, toss in the sugar & water and cover the pot. Keep an eye on the oats in the oven so that they don’t burn. Leave the rhubarb for 5 mins at a low simmer, then turn the heat off, turn the rhubarb again in the water and replace the lid again. Check the oats in the oven, they should be starting to turn a golden brown colour. Once they turn golden remove them from the oven and leave to one side to cool. 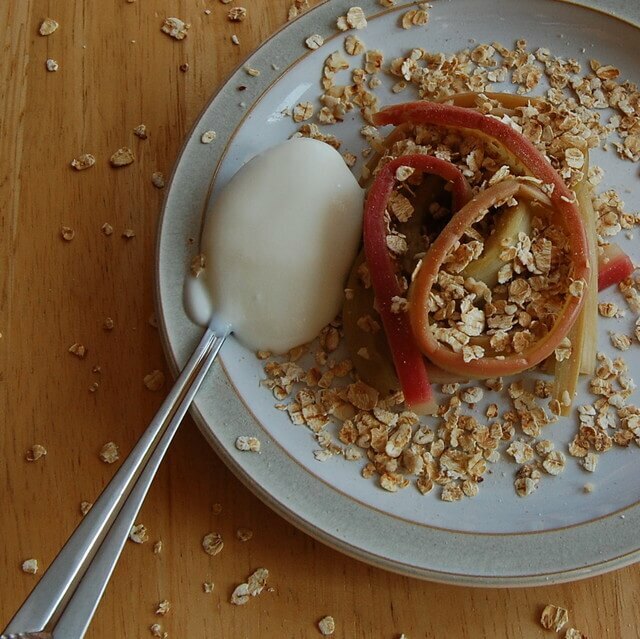 The rhubarb is now cooked, serve with a sprinkling of toasted oats and a spoon or two of natural yoghurt. The cooked and cooled rhubarb will keep for a day or two in a sealed container in the fridge and the toasted oats will keep in a dry, sealed container for the same amount of time. Great different and healthy idea. I love rhubarb too but I tend to always go down the route of crumbles. Thanks Sinead. Call it a deconstructed, nearly sugar free crumble if you will. I think I’ll have to do it again soon. What is fruit sugar? I live in the US and have never heard this term. Love your blog! Hi Karen it’s also known as fructose. Your best bet would be Whole Foods I think. Thanks for dropping by!